Back at home after an uneventful drive in the predicted rain and 50 mph winds (which didn't happen, luckily for me!!) I have an RV badly in need of a wash. This is a pretty daunting task. I do have a very tall ladder, but I see sore muscles in my future. Is there any easy way to do this??? Least I brought the rain with me so I get to put it off for one day. Is it a full moon or something????? Still no EPA verification on the motorhome and now the local dog catcher is after me for Cooper's rabies shot. They say it expired, the Vet says 2014. YOU guys fight it out!! On a good note ... if you have an REI (Recreational Equipment Inc) Visa card and you are an REI member, you get year end dividends that you can spend in their store. I just received mine ... $262. It's shopping time!!!! Good thing I got up early. I totally forgot about emptying the fresh water tank of the ever tasteful Arizona water and replacing it with good Buzzards Roost drinkable water. That accomplished, rather easily I might add, I proceeded to pack up the dogs for the trip. Never having been in a large RV, both Cooper and Jessie were suitable impressed. I was a little afraid that they would not stay on the couch while I was driving, so I included my doggie gate. Do they look nervous to you??? The good news is they never got off the couch. In fact, I think they were frozen with fear cuz they never moved an inch!! Somewhere along the way I was supposed to meet up with my friend Cyndy who would follow me up in her car. Well you know how that goes ... best laid plans. She sent me directions for a completely different route than I was taking. After a few phone calls, we decided on a place to meet ... where I waited ... and waited. Come to find out, she was 45 minutes away in Woodland (??) 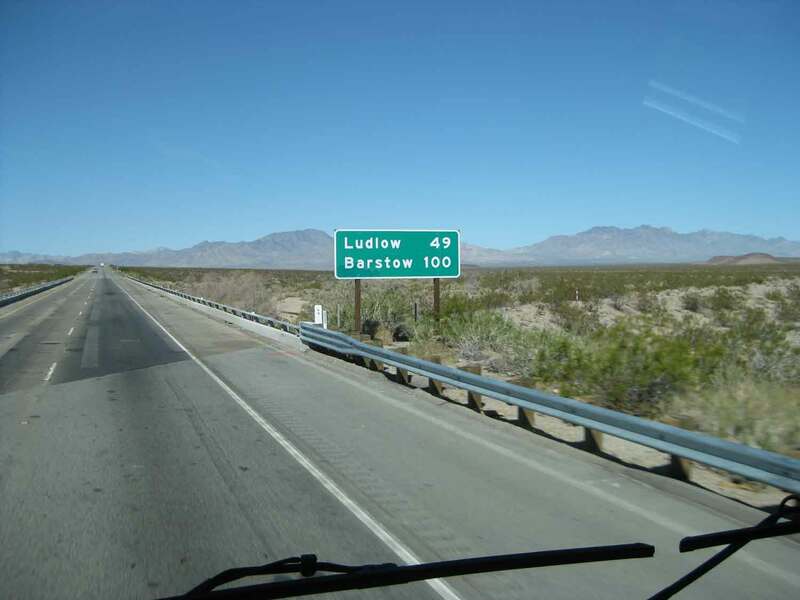 so I continued on in the hopes of meeting her at the first place I could find to pull over, which was Trowbridge. I know, I never heard of it either!!! This image is probably the reason why!! Not much here ... so after waiting another 30 minutes, I received a phone call and now she was north of Marysville?? Okay Cyndy, I'll just meet you in Chico. Luckily the weather stayed overcast but didn't rain. I say luckily because I couldn't seem to find out how to turn the windshield wipers on!! Further down the road, I saw Cyndy parked off to the side, and I waved as I passed by!!! It was a nice trip, a little windy at times, but nothing compared to Arizona. 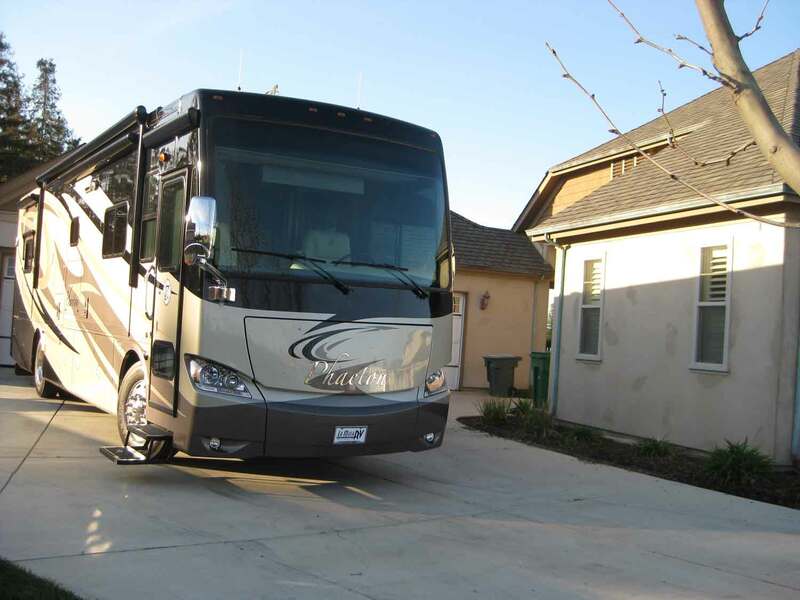 The Almond Tree RV Park is a great facility. Lots of room, well trimmed trees so my satellite works, level pads and a huge grassy area surrounding the entire park for dog walking. The clubhouse here is large, clean, has a great kitchen and the nicest (warmest) restrooms ever. I highly recommend staying here!!! Even has a pool, but it's just a little too cold for swimming right now. Another three phone calls later (16 so far), I was able to determine that the Certificate of Origin had indeed been overnighted (thanks to Karen at La Mesa in San Diego) to my local DMV office. I got the tracking number, the time delivered and the signature name. I wasn't taking any chances. In the meantime, I'm now trying to locate the engine access panel in the RV. After lifting up the bed and scraping with my fingernails, I was able to locate 3 screws which I removed far enough that I could use them as handles, as there are none on the panel. And what to my wondrous eyes should appear??? The braces for the bed are installed with screws ON TOP of the panel. Two broken fingernails and very sore fingers later (from running them over the carpet a hundred times trying to find the screws), I had located one of the many screws holding IT in place. Time to get back on the phone. What irritates me is that the service guys seem to think it is ME that can't find the screws ... they would be able to locate them easily. Ok guys, my friends that know me, know this isn't true. I was born and raised on a broke cattle ranch. We fixed everything from the caterpillar tracks to the vehicles (World War II jeeps). There was nothing I didn't help repair. Soooooo time for another phone call. I did have the foresight to make an appointment with DMV this time to avoid the 90 minute wait in line. Knowing I would have to deal with Miss DMV, I came prepared for war. I just wanted to pay the fees and get out ... I'll worry about the certification later. Much to my obvious surprise, I was lucky enough to get a just hired new girl ... which was a good thing. Not jaded, she smiled ... and talked ... and smiled!!! Not familiar with my paperwork, she had her supervisor-trainer helping her. OMG they were sooooo nice. I had a chance to talk to the new girl and told her how awesome it was to speak to someone "nice". She laughed!! and agreed that there were some "personality" problems. I pleaded with her not to become one of THEM!! She laughed again. I couldn't believe my luck!!! Both girls processed my paperwork, took my check and actually thanked ME!!!! The supervisor also gave me the phone number and name of the verification person at the local CHP office that could do the EPA verification using a mirror. I walked out on cloud nine!!!! I'm going to go put the screws back and soak my sore fingers. I'm warning you up front, there are some bad words in this one!!! Probably the worst ever trip to DMV was today. I'm trying to register the Tiffin Phaeton that I purchased in Yuma Arizona. Unfortunately I have to deal with the California Department of Motor Vehicles. See this heading on their registration paperwork??? It says A Public Service Agency. They should actually read that some time. Apparently, the word SERVICE is not something they understand ... well it is in English ... maybe that's the problem. After waiting in line for 15 minutes, I got a ticket to wait in line for another 1-1/2 hours before my number was finally called. THAT person handed my paperwork back and said I had to drive the vehicle down to their parking lot. I did ... and after waiting another 15 minutes, got called again. They asked for a certificate of origination. Stupid me, I didn't know what that was, nor could they tell me what it was, other than it was something they needed. I called La Mesa RV Yuma, who sent me to La Mesa RV San Diego, who was nice enough to say they would FED EX it to her immediately. Now the trip out to the RV. She put all my paperwork on a clipboard and said she would meet me outside. Five minutes later, I'm still waiting ... but being the patient person I am, I just stood there. Finally she came out ... ooo'd and aaa'd over the RV and how big it was. I asked her what she needed and she said the VIN# and the EPA sticker. I knew where the VIN was, but not the EPA. She actually asked me for the owners manual, where it stated that the Cummins engine met all California emission standards for diesel engines. But she wanted a sticker. Thus began the first of 13 ... yup you read it right, 13 phone calls to find out where the hell the sticker was. It's next to the drivers side window ... Nope. It's in the bathroom cabinet ... Nope. It's in the other medicine cabinet ... Nope. There's a door to lift up by the bed ... Nope. There's a door under the bed ... Nope. There's a door in the closet floor to open ... Nope. There's some screws to take out in the closet floor and rip up the carpet ... so you REALLY want me to rip up the carpet in this new $200,000 coach????? ... NOPE with a capital N!!!! Well if you crawl under and come up next to the engine, it's on the cover of something, except you can't see it cuz it's covered by a piece of black tape ... Nope on that one too, cuz Miss DMV isn't going to crawl under anything. I'm sorry, but could SOMEONE PLEASE GO LOOK at the same model and tell me how the hell to access the engine???? Well, we would, but we don't have one here. OMG!!!!! You just can't imagine ... if I had a gun, I would have used it on myself!!! Well Miss DMV now says she can't register it without that sticker ... she has to personally see and touch it or my vehicle will NOT be registered. I said "that's why people register these vehicles out of state and California loses the money". She wrote VOID on my paperwork and handed it back to me. I drove home. MAD MAD MAD!!! I have now made exactly 13 phone calls, including the first to my (at least used to be) good friend DAN, who suggested I call Tiffin and have them mail me a sticker. Good idea, except they are now closed!!! Finally, I actually spoke to a sane person in San Diego, who contacted the Davis La Mesa RV dealership, who called me very apologetically, and said they would get a sticker for me, one way or another. In the meantime, Miss DMV is going to get another application with my certificate of origination in the mail tomorrow, and I have to go back and deal with her. The San Diego office told me they HAD to accept my application and money, and that the verification could be done at a later time, so as not to get caught by the "20 day rule" (register it within 20 days or go to jail!!!) Why didn't Miss DMV tell me to go ahead and pay the fees???? I was in the REAL service business for 23 years with a public agency. If anyone couldn't read, or just didn't understand that word SERVICE, we explained it to them. Unfortunately the State of California doesn't agree with my definition, and certainly doesn't hire or train employees in it's definition or specific uses. To Be Continued ....... tomorrow after another (I'm sure) AWESOME time in the last place on earth I want to be for even a millisecond!!! Seems like one place I could use some help is organization. I try, but there are so many more fun things to do!! First off, since I am a San Francisco Giants Season Ticket holder, I just received 176 tickets to the games for this season. Needless to say, they are VERY expensive, so I sell every game possible and go to just a few. They come in sheets, which I have to tear apart and match up the two seats to each day. Thus I discovered a printing error ... one sheet printed twice. Next I create a spreadsheet, and going through each and every ticket, put down the date, time, price, team playing and giveaways available. This list is then sent out to my list of buyers (thankfully I HAVE a list of buyers). Usually within 3 weeks, most are sold. USUALLY!! However yesterday, I sat at the computer, trying to keep organized, and sold all but 5 games in three hours. CRAZY!! Then comes the hard part ... putting down names and amounts, getting tickets in envelopes and collecting money. I had them spread out all over the floor. Just hoping I was organized enough and everyone gets the right tickets!!! Second challenge was the basement of the Phaeton RV. It looks huge, but once you start loading it up, it isn't so big after all. I looked everywhere for milk crates to put things in so I could be "organized", but so far have been unable to locate any. Well ..... MY solution was laundry baskets!! Lightweight, just the right size for me to move around, it holds all the loose stuff. Luckily this handy slide-out underneath, makes everything accessible, as it pulls out either side. Buckets for washing windows, a gas-station-type window brush and squeegee with extending handle, folding chairs, extra sewer hoses, extra water hoses, 30 amp electrical extension cord, 6 different adapters (don't ask), patio carpet and 2 x 6's. You never know when you might need a good 2 x 6!!!! Here's an interesting one ... notice the first BIG step for the back ladder? Really??? People will try to crawl up on your RV so you don't make the ladder go to the bottom? I did notice in Yuma that everyone, and I mean everyone with a big coach, had a regular step ladder. When I returned, I discovered that there is no way to wash the coach or even get the front windshield clean of all those nasty bees, without a ladder. And so you can see the top of mine here, as well as the Dirt Devil built-in vacuum system, the case of DEF fluid (see previous post! LOL), a fishing box with some tools, nuts and bolts stuff and my Makita Drill. I know, "men" tools, but I actually have quite a few. My best Christmas present ever was a Chop Saw!!! Next purchase will be some tire/wheel covers. I know they are to keep the sun off the tires, but I want to keep these beauties CLEAN!!! Hmmm make note to buy wheel cleaner. New Image - I Love Photoshop!! After messing around with the opening image, I finally settled (at least temporarily) on the Maui Sunset picture I took last year. Not much photoshop on that one ... but the following one is ALL photoshop!! It won't make the final cut for sure, but I'm working on one that shows the "family". Obviously I'm an animal lover, whether they be mine or someone else's. While visiting friends Patty and Dan in Lake Havasu, I got to spend time with their two sweethearts Gracie the kitty and Sami the beagle. Sami is quite old and has arthritis, but that doesn't keep her off the couch or the dashboard of their RV. This is the look I got when I tried to share her bed .... In return, I had to provide lots of petting! Gracie is a cat of a different color! I've never seen a more active cat and I've owned quite a few. She is into everything!! Including the cabinet when Patty was getting the plates out. Aha!!! An open cabinet. Wonder if I can get up in there?? Yup I'm sure there's enough room. Any snacks in here???? When caught red-handed, she headed for her spot by the sink. This kitty loves to play in the water!!! As long as you give her a trickle, she will play for hours, getting soaked and not caring one wit!! Finally home, MY little guy was all tuckered out from playing the ball game. A fanatic, he'll bring you the ball 800+ times as long as you throw it for him. Eventually I get tired of the game and put the ball away. My friend who was housesitting, just kept throwing it until Cooper finally gave up!!!!! Been messing with this image for over an hour. If I put a title actually on the image, Kissack Adventures covers it up. If I "don't" put a title on, Kissack Adventures doesn't appear at all. What's up with that??? Having arrived safely in Lake Havasu and making it into the driveway (eeeeekkkk it's narrow!!! ), I was able to relax and spend a couple days with Patty and Dan. Except we didn't exactly relax, we spent every day running around getting organizational "stuff" for the motorhome. Dan took this picture of me and my new home parked in his back yard. While Patty and I went shopping, Dan (awesome guy that he is) set up my utility bay with sewer hose, soap in the dispenser, paper towels and most importantly, drilled a small hole for drainage at the bottom of the bay. Worked perfect, because when we flushed the tank, water indeed filled the bottom and drained out. Then he pulled up the plastic covering laid over the carpet to keep it clean while at the showroom AND plugged a space under the bed where my dogs might go and get in trouble. Besides all that, he tirelessly explained the systems no matter how many times I asked!!! With baskets, dividers, a new toaster oven and bathroom picture, I was ready to head back to California. To show you how great this couple is, Dan again road with me to the nearest Love's for diesel, while Patty followed in their jeep. Last minute fueling instructions and exhaust brake directions, and I was off!! Not exactly a relaxing ride (nerves), but I kept it at around 59mph. After 45 minutes, I was actually able to find a radio station. The radio and GPS are one in the same with so many buttons on the display I couldn't figure out how to work either. 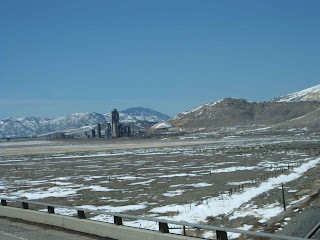 A big snowstorm hit Tehachapi on Sunday, so I wasn't looking forward to driving through that area. By today however, it was beautiful with dry roads. I didn't even stop. With half a tank of fuel left, I headed to Bakersfield. Home at last, 9 hours later, I'm totally beat! Tomorrow I will get her ship-shape!!!! The day is here!!! First day of driving the Tiffin Phaeton diesel pusher motorhome on the road. Everyone please give me a wide berth!! Scary scary!!! I have to give it up for this dealership. When I arrived in Yuma, I called the office and they sent a truck to pick me up at the airport. I was escorted to the RV that is my new home, all set up for me to live in. After three hours of up and down stairs, I transferred everything from my old fifth wheel to the new beauty. Hmmmm ... what to put where. I have four times the space and can't decide where to put everything. 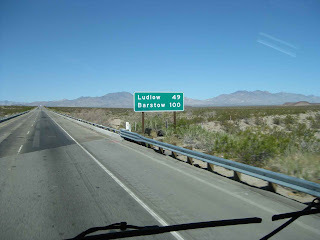 Patty says don't worry, she'll show me how hers is set up when I get back to their house in Lake Havasu. Thankfully, Patty and Dan are meeting me this morning here in Yuma so Dan can give me hints and tips on driving. Hope he took some anti-anxiety pills!!!!! We are going to Lake Havasu where I will wait for the sierra storms to subside so I can navigate Tehachapi pass easily. I have spent the last two days running everything, figuring out the "order" of things, and believe me, there is an order. The long mirror I had in the old rig was the first thing to bite the dust. In closing one of the slides, it got caught and broke the frame. Not that I need it, I have two closet door mirrors. When Dan was here last week, he went over the whole unit for me, looking for things that need to be fixed and the list was presented to the Service Department. When I arrived, the first thing I did was get out the list!!! Took me awhile to get everything done, or at least I thought it was all fixed ... but one hydraulic leak remains. The Service Department, however, is closed for the weekend and I need to leave. They do have a La Mesa RV Service Center in Davis California, near a friends house, so that may be my first trip when I get home. That said, I'm actually surprised at the Tiffin quality. I expected a few things not to work, but the only adjustments needed were minor in nature. The hardest thing to deal with was the TV's. Turn one on and both in the living area come on. Turn one off, both went off ... took me awhile to figure that one out!! My dish network travel'r satellite dish was installed on the new rig and works like a charm. Lastly, I was able to talk them into giving me some diesel for my trip home. Ouch ... a hundred gallon fuel tank sounds great until you have to fill it up with $4.39 per gallon fuel. They put in $200.00 worth. My advice to anyone looking for a new motorhome would be to check out La Mesa RV and find someone like Dan Chance who knows everything there is about RV's. Without Dan, I probably wouldn't be a happy owner. He basically handled all the negotiations for me, including my trade-in and the extended warranty. Thanks Dan ... you and Patty are the best!!!!! One 7 foot couch that makes into a queen bed (table side) and a loveseat which also makes into a smaller bed (kitchen side). Four TV's, yes that's FOUR!!! One in front, one you can see above, one in the bedroom and one outside under the awning for outside parties. Full size Kitchenaid fridge with ice maker ... we're uptown!!!! Bathroom ... actually has an additional sink in the bedroom ... and a large shower. The back has two slideouts ... one with the TV and drawers and one with MY queen size bed. And finally .... a washer and dryer for when you have full hookups. Amazing, huh????? So here I sit in the RV at La Mesa for a couple days, pushing every button and having small things fixed before I take off. Thankfully, Patty and Dan are arriving tomorrow morning so Dan can give me some driving lessons and accompany me back to their house. Take some chill pills Dan ... I've never driven one of these before!!!!!!!!!! Slight delay in the Gypsy Rally blog .... as you will see, I've been VERY busy!!! The Rally is put on by Nick and Terry Russell .... Once you meet them, they are like family!! Terry is quite the opposite of Nick, quiet and shy. Nick on the other hand would be a great stand up comic. Every day they have seminars regarding everything RV, from boondocking to traveling solo to solar systems. 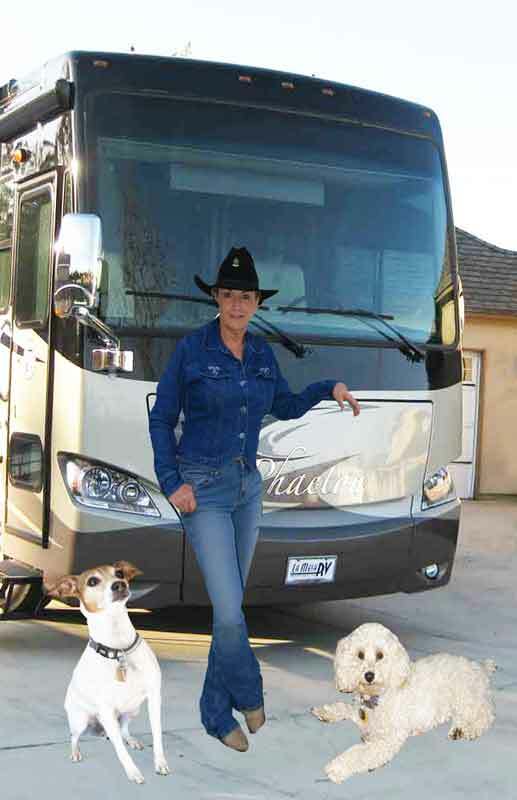 Remodeling your RV (yup, make it home) and everything in between, including driving tips for women and how to handle fires, heaven forbid you should have one. Dan moderated the seminar "Boondocking" ... or how to stay in your RV for days without electrical power. The entertainment was awesome ... this guy can yodel like nobody's business!! 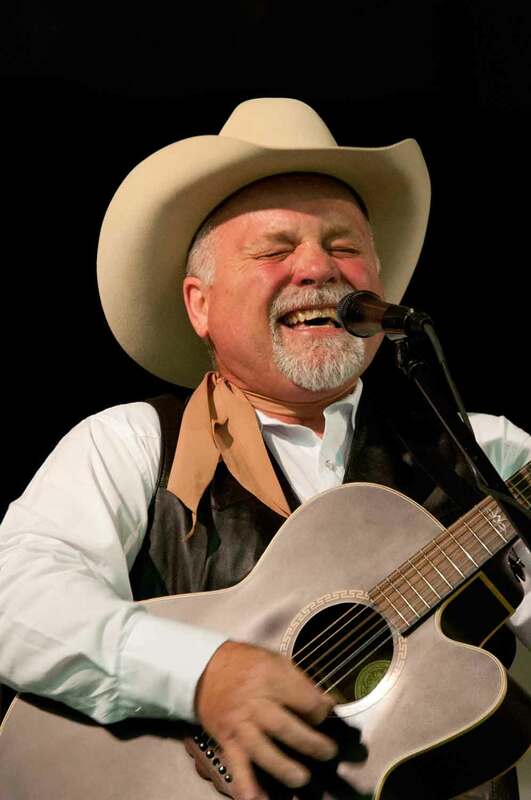 Amazing country and western singer, a former Sons of the Pioneers ... I apologize that I do not have his name. I'm not at home where all my paperwork is ... how embarrassing!! Next up, the pizza party ... I'm guessing 400 very hungry impatient people served hot pizza in a matter of 5.5 minutes. Terry has this down pat for sure!!! And it's all you can eat, or until they run out, which they didn't. Pizza is a staple in my weight-loss diet, but not for my friend Patty. How she sat there while we ate in front of her, I'll never know. 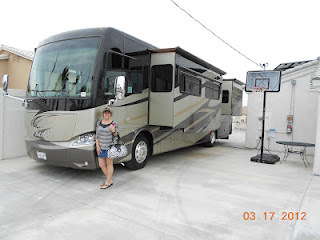 So while here, we made the short trip out to La Mesa RV just to take a look. It was my idea to wait 5-6 months and maybe look at purchasing a new RV ................ Next you see why I've been so busy!!! Finally!!! I'm off on another adventure to Yuma Arizona. Nick and Terry Russell publish the Gypsy Journal Newspaper and have two rallys a year for RV lovers. The West Coast version is at the fairgrounds in Yuma. Having been last year with my good friends Patty and Dan Chance, I didn't want to miss it. I try to plan my trips ahead so I know how far to drive and where to spend the night and get fuel. I was all set for a long drive Friday to Beaumont-Banning area in southern California, spending the night at the Elks Lodge when Dan called and asked if I had checked the weather predictions for WIND!! Uh ... no ... wind?? ... 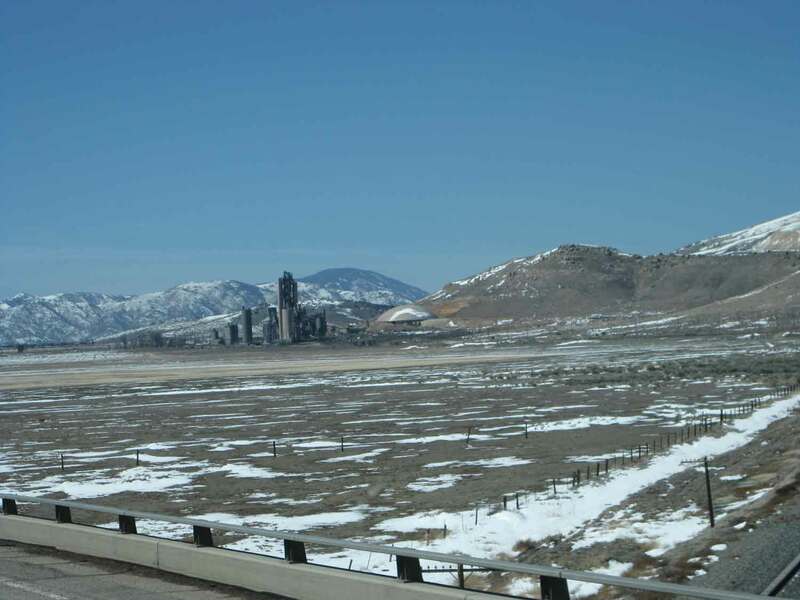 I was so concerned about SNOW over Tehachapi that I had not considered wind. Apparently it was 40 mph in the Yuma area ... my RV can handle about 25. TOTAL change of plans!! 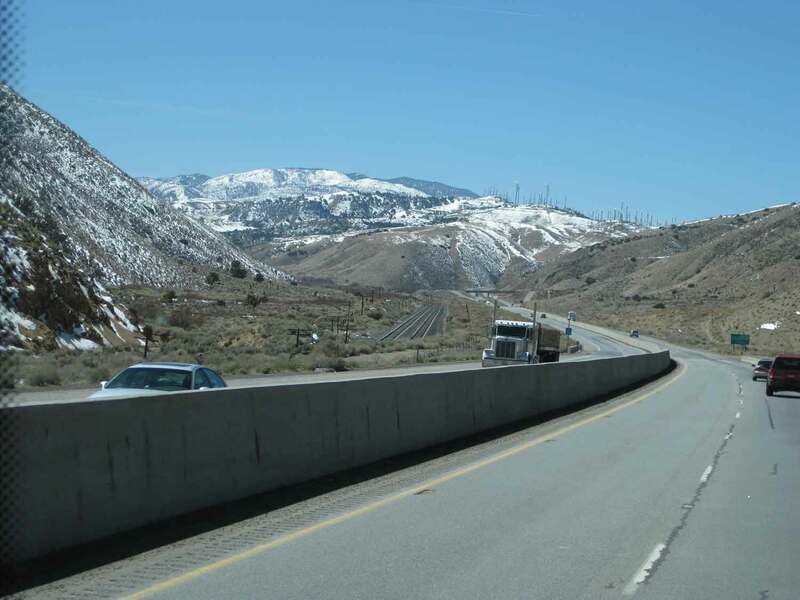 The NEW plans are to drive the short leg to Tehachapi and spend the night, driving the long leg to Yuma when the winds had subsided. This is my second home over the pass where I have spent many nights. Good thing I planned for all weather, cuz it was 36 degrees when I took this picture as I was heading out at 6:15 a.m. in order to get through Banning before the winds picked up again. It was a long drive the second day, broken up by several doggie stops, but I love seeing new country. Just as I pulled off the freeway to the fairgrounds, Dan's timing was perfect ... he called to see where I was. Entering the back of the fairgrounds, the "parking crew" staged in a large lot to spend the night before locating OUR final parking sites. The crew then met to discuss the rules about who is allowed to park where for the Rally. Yes, another Cooper sunrise. He has me up and out with him before the sun comes up every morning!!! Sunday morning, we moved to our usual spot ... out by the horse barns. It's perfect!!! A few trees for shade, power, water if needed, LOTS of sand and no neighbors. Yesterday as Dan was parking people, Patty and I took off for a full day of shopping!!!! The main attraction is the huge Flea Market they have here where I got Jessie a new harness, and me LOTS of stuff including LED lights for my RV, a Route 66 shoulder bag, two (yes TWO) watch bracelets for $7.95 each (Patty swears they last for years) and miscellaneous "stuff". A not so quick trip to Walmart for food finished off the day. After a great chicken spaghetti dinner that Patty cooked, I was off to snooze land.